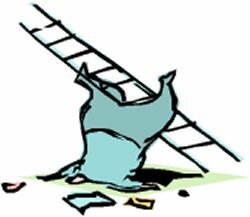 A ladder can come in really useful for all kinds of DIY tasks around the home, from step ladders for interior decorating to extension ladders for cleaning gutters or replacing roof tiles. If you like to “do it yourself”, purchasing your own ladder can be a worthwhile investment that will prove invaluable to have on hand over the years for those never-ending home improvement jobs. 1: What are you going to use your ladder for? It’s likely that a ladder will come in handy in all sorts of situations, so it’s worth having one that is adjustable. A good multipurpose ladder can be used as an A-frame step ladder when not too much height is needed, such as when trimming a hedge or hanging curtains. It will also have the option to convert to an extension ladder, where the ability to extend the height a rung at a time is invaluable when doing jobs such as painting the exterior of a house. Another benefit of having an adjustable ladder is that it can easily be folded up compactly for easy storage. 2: The weight of your ladder is an important consideration – many people are surprised at the difference in weight between a heavy fiberglass ladder and a lightweight aluminium one. If you’re planning on moving your ladder around as you work, for instance if you’re cleaning upstairs windows, bear in mind that ladders made from aluminium are significantly lighter and therefore much easier to shift from one position to another than those made from fiberglass. This makes jobs like cutting a hedge or painting a house much less strenuous. On the other hand, if you are really serious about DIY, a professional grade fiberglass ladder might be a good buy. Fiberglass is strong and durable, and should stand up to years of use. It is also non-conductive, so it is safer to use a fiberglass ladder if doing electrical work or whilst working near electric cables. 3: Safety should always come first when using any ladder, to avoid accident or injury. The 1:4 rule should be followed when setting up a ladder i.e. the space on the ground between the foot of the ladder and the wall should be a quarter of the height of the ladder. For example, if your ladder is 16ft long, to have a safe angle of lean the bottom needs to be 4ft from the wall. 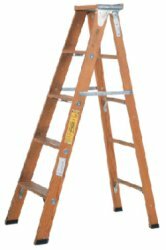 When choosing a ladder, look for safety features that add to its stability such as anti-slip rubber feet on the top and bottom, wide serrated rungs for better grip and secure locking for different configurations. Once you’ve found the right ladder for your needs, it’s sure to come in handy on numerous occasions and the money spent on it is soon saved by not having to hire a ladder for all those odd jobs. If you are looking to purchase a ladder then it maybe worth checking out this online ladder resource with tips on using all sorts of ladders, from traditional extension ladders to the versatile Little Giant Ladder and more.